A new satellite, the size of a cereal box was sent into the center of Hurricane Florence, and the results are remarkable. A new experimental weather satellite no bigger than a cereal box got an inside look at Hurricane Florence in a test of technology that could influence the future of storm monitoring from space. The satellite took its first images of Hurricane Florence on Tuesday, September 11, just hours after its instrument was turned on. This animation combines the TEMPEST-D (Temporal Experiment for Storms and Tropical Systems Demonstration) data with a visual image of the storm from NOAA's GOES (Geoweather Operational Environmental Satellite) weather satellite. 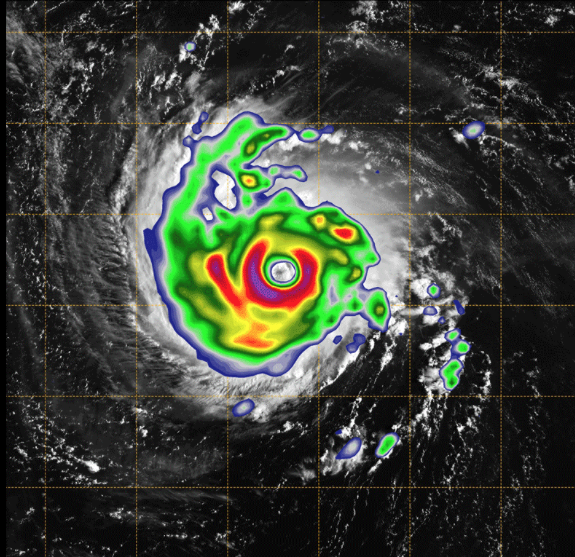 The brightly colored image taken by the small, experimental satellite TEMPEST-D captures Hurricane Florence over the Atlantic Ocean. The colors reveal the eye of the storm, surrounded by heavy rain. The green areas highlight the extent of the rain being produced by the storm, with the most intense rain shown in the yellow and red areas. The TEMPEST-D data is contrasted with a visible image of Florence taken by the GOES weather satellite, which shows the familiar cyclone-shaped clouds of the storm, but doesn't reveal what's inside. TEMPEST-D, which deployed into low-Earth orbit from the International Space Station in July, carries a state-of-the-art miniaturized microwave radiometer, an instrument that sees through the thick clouds to reveal the hidden interior of storms, just like a security scanner can see inside luggage at the airport. The image taken by TEMPEST-D (Temporal Experiment for Storms and Tropical Systems Demonstration) captures Florence over the Atlantic Ocean, revealing the eye of the storm surrounded by towering, intense rain bands. The green areas highlight the extent of the rain being produced by the storm, with the most intense rain shown in yellow and red. The TEMPEST-D data is contrasted with a visible image of Florence that shows the familiar cyclone-shaped clouds of the storm but doesn't reveal what's inside. TEMPEST-D's mission is to test new, low-cost technology that could be used in the future to gather more weather data and help researchers better understand storms. The level of detail in the small-satellite image is similar to what existing weather satellites produce. "We were challenged to fit this instrument into such a small satellite without compromising data quality and were delighted to see it work right out of the box," said Sharmila Padmanabhan, who led the instrument development at NASA's Jet Propulsion Laboratory in Pasadena, California. Shrinking weather satellites could one day help scientists provide more frequent updates on developing storms. "TEMPEST-D paves the way for future missions where we can afford to fly many of these miniaturized weather satellites in constellations. Such a deployment would enable us to watch storms as they grow," said Steven Reising, the principal investigator for TEMPEST-D at Colorado State University. TEMPEST-D is a technology-demonstration mission led by Colorado State University and managed by NASA's Jet Propulsion Laboratory in Pasadena, California, in partnership with Blue Canyon Technologies and Wallops Flight Facility, Virginia. The mission is sponsored by NASA's Earth Ventures program and managed by the Earth Science Technology Office. The radiometer instrument was built by JPL and employs high-frequency microwave amplifier technology developed by Northrop Grumman Corporation.